This is one of those cd's that will catch your eye from the start. 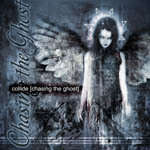 Haunting artwork by Chad Michael Ward (digitalapocalypse.com) graces the cover of Chasing the Ghost, the latest release by Collide. While the cover artwork alone is worth the price of admission, once you step inside this cd the real ride begins. The name Collide is described by vocalist, kaRIN, as "a collision of sounds all smashed together". True. kaRIN's vocals are sensually velvet smooth, yet razor sharp - much like the dress of razors she adorns in the photo on the inside sleeve. Yes, a dress constructed solidly of razor blades! The track Razor Sharp ties in with this razor theme, and features hypnotic, distorted vocals by kaRIN. Statik informs me that there was a vocal processor used on this track, a Pro-Tools plug-in. Favorite tracks on Chasing the Ghost include one of the best remakes I have ever heard. A cover of the classic Grace Slick song, "White Rabbit". The other is the title track, Wings of Steel. Yes, the title track for Chasing the Ghost is actually named "Wings of Steel" on the cd. A close decision, states kaRIN... "Ultimately, we decided we wanted to make it slightly different from the title of the album". Chasing The Ghost is a collision of violet velvet laced with barbed wire and razor blades. Pleasure and pain wrapped in an angels wings of steel. I highly recommend this cd!